Simple Streamers - Fly Angler's OnLine "Intermediate Fly Tying Part 47"
If you've been trying to keep up with this series to this point, it's very important that you learn the patterns or procedures used in the next two weeks of tying. What you learn here will help you tie the flies coming up in a couple of weeks. There's nothing particularly hard about these flies, but there are a few tricks that will be helpful later. 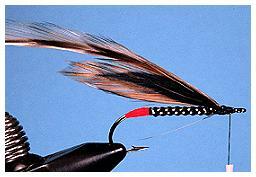 Streamer flies are capable of catching just about everything that swims and has fins. They imitate small minnows and such, and that's what a vast majority of fish eat when the opportunity presents itself. 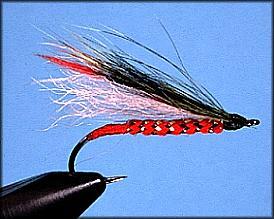 Even little fish will pounce all over a streamer that's small enough to fit in it's mouth. 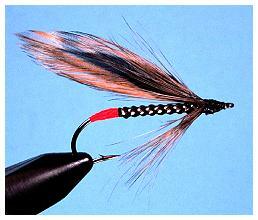 The first fly this week is one that has caught many different types of fish for me. They range from a 32 inch brown trout, caught in the Missouri river in Montana, to many four pound plus smallmouth bass caught in South Dakota. A few walleyes and a pile of northern pike round out the selection. As usual, you have the option to modify, fine tune, or adjust the pattern to suit your needs. In fact, I tie a whole series of little trout streamers designed to look similar to juvenile trout in the many forms they appear. The idea here is to represent the fish in a basic form rather than an exacting imitation. Many times that works better than having a fly that looks exactly like what a minnow looks like to our eyes. Fish see things differently than we do, and many times it's better to have flies that are more general in appearance than the exact representations you sometimes see in books and magazines or in fly shops. You'll notice I'm using a different type of mylar tubing than you usually find in a fly shop. I like the looks of multi-colored tubing, and I found that craft shops usually carry a good selection of the multi-colored stuff I'm using here. The color of the tubing is part of the allure of the fly, so it's a good idea to have a good selection on hand. Experiment a little to find the colors that excite your local fish. 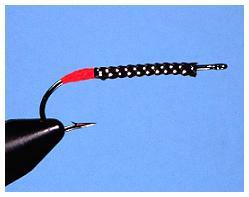 Hook: Any straight-eyed streamer hook that's 2X long or longer. Sizes 1 to 12. Thread: Red monocord and black monocord, 3/0. Body: Mylar tubing. Select colors to match the natural color of the minnow you want to imitate. For the Little Rainbow Trout, I'm using red and silver mylar tubing. 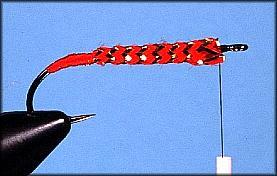 Wing: A mix of white calf tail, red dyed squirrel tail and green dyed squirrel tail. Again, select colors that match the natural you wish to imitate. Eyes: None, or if you like, you can paint some on in red or yellow. 1. 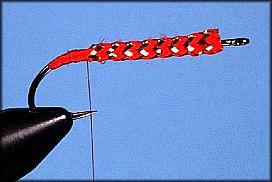 Start the red thread and wrap it back to the bend of the hook. If you want to add weight, wrap lead wire on first, then tie it down with the thread. A drop of super glue is always a good idea to hold the lead firmly in place. 2. 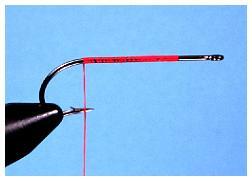 Cut a piece of red and silver mylar tubing a little shorter than the hook shank and slip it over the hook as shown. 3. Using loose wraps of thread, start tying the mylar tubing down to the hook. As soon as you have it secure, tighten the thread and finish covering the ends of the tubing with thread. 4. If you know how to whip finish by hand, you can use that to tie off the red thread. If not, make a loop of fine monofilament and wrap over it six to ten times with the tying thread. Hold the tying thread in place with your finger, trim the thread and put the end of the thread into the monofilament loop. Pull the loop through, under the thread wraps you just made and cinch it tight. This is the same knot a whip finish creates. Trim the tag end of the tying thread. 5. Start the black thread behind the hook eye. 6. Make several loose wraps of thread over the end of the mylar tubing, then slide the tubing forward to tighten it. Now cinch the thread fairly tight. 7. Finish tying the end of the tubing down to the hook. 8. 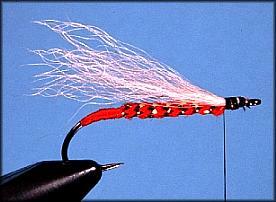 Select a small bunch or white calf tail hair and tie it in so that the tips extend just past the bend of the hook. 9. 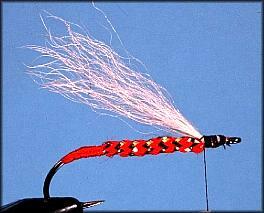 If the calf tail hair wants to lay too flat on the hook, you can resolve this problem by making one wrap of thread behind the hair then pull the thread forward until the hair is at the right angle. 10. Make a couple of extra wraps of thread around the hook to secure the hair in place. 11. 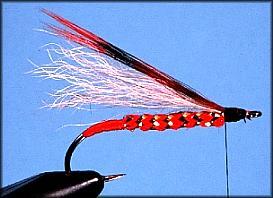 Tie a small bunch of dyed red squirrel tail hair directly on top of the calf tail hair. 12. Tie a slightly larger bunch of dyed green squirrel tail hair directly on top of the red hair. 13. Make a smooth head with your thread, whip finish, trim the thread and cement liberally on the head and base of the wing. Dace minnows are common to just about any stream on our continent. 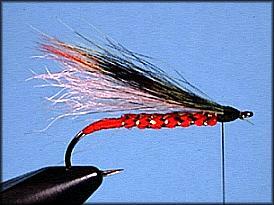 Actually, the procedures used to tie this next fly can be used to tie just about any minnow streamer. 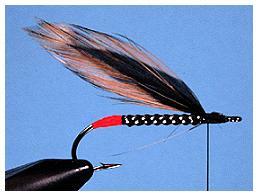 Mix and match the body, wing and hackle colors to match the natural minnow you want to imitate. Thread: Red flat waxed nylon (single strand floss that has been waxed) and black monocord, 3/0. Body: Mylar tubing. Select the colors to match the natural color of the minnow you want to imitate. For Al's Dace, I'm using black and silver mylar tubing. 1. 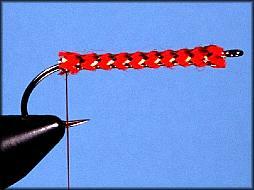 Start the red thread and wrap it back to the bend of the hook. If you wish to add weight, wrap lead wire on first, then tie it down with the thread. A drop of super glue is always a good idea to hold the lead firmly in place. 2. 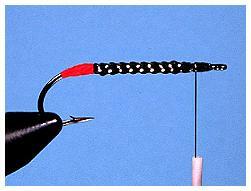 Cut a piece of black and silver mylar tubing a little shorter than the hook shank and slip it over the hook as shown. 3. Using loose wraps of thread, start tying the mylar tubing down to the hook. As soon as you have it secure, tighten the thread and finish covering the ends of the tubing with thread. Whip finish the same way you did in the last fly. Trim the tag end of the tying thread. 4. 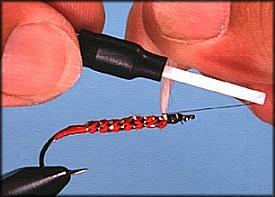 Start the black thread behind the hook eye and tie the front end of the tubing down like you did in the last fly. 6. 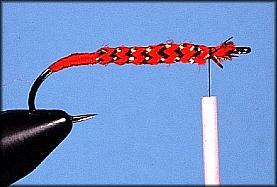 Select a soft hackle feather and tie it to the hook in front of the wing, curvature down and back. 7. 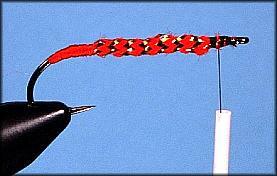 Wrap the hackle in front of the wing as shown. 8. 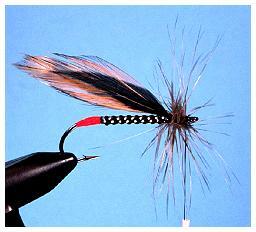 Pull the hackle back and wrap over it with the thread to hold it back in a swept position. Form a smooth head, whip finish, trim the thread and cement liberally. 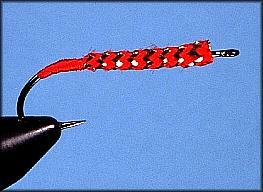 Your finished fly should look something like this. In case you wondered why I saved these simple flies to this late point in the series, I want the procedures to be fresh in your mind when we get to the flies that are coming up in a few weeks. They will be a little more complex, and will use multiple materials and married materials in the wings. For now, get creative and tie up a selection of streamers in your favorite colors.